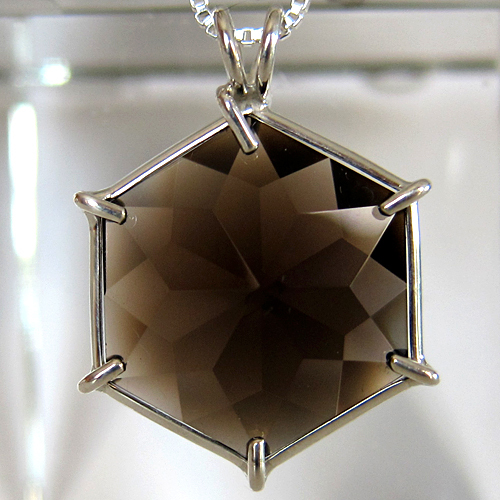 Dimensions (HxWxD): 1" x 0.75" x 0.3"
This beautiful smoky quartz crystal pendant is a Flower of Life faceted cut, inspired by Marcel Vogel. It comes on a simple sterling silver chain which allows it to hang freely right at the thymus between the throat and the heart chakras, in its own velvet jewelry box. It is a unique flower-like 12 pointed star in a sterling silver setting which shows its luminous quality and allows the stone to breathe. It is a wonderful tool for personal growth on ones spiritual path. The 12 pointed star is "associated with Christ Consciousness and the restoration of Divine Order. It is an evolutionary tool for those who wish to reclaim the purity and grace of their soul, as it was originally created. The Flower of Life places one within the center of abundant nurturing energy of the Universe." We often recommend that our Reiki and past life therapy clients wear crystals or gemstones for protection and healing. Each type of crystal has its own unique energy signature which has imparts distinct metaphysical properties to the stones. 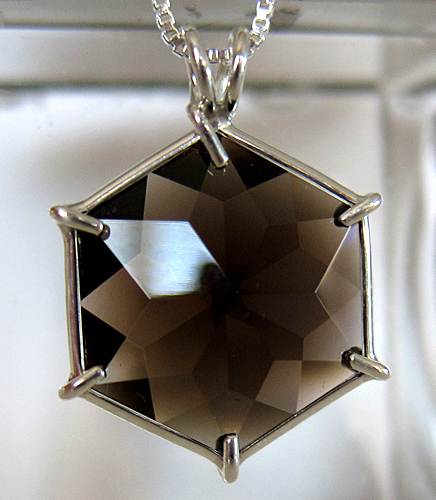 Other mineralogists suggest other theories concerning the dark pigment in smoky quartz, including: the presence of trivalent titanium, the presence of carbon compounds, and more. Smoky quartz has been a favorite healing stone of shamanistic practitioners around the world for tens of thousands of years. Read more about smoky quartz crystals and other types of crystals at the SatyaCenter.com crystalshomepage. Note: Weight above is shipping weight. Actual weight of this pendant is .30 oz. Each piece is unique and may vary slightly in color, appearance and dimensions. Each piece is guaranteed to be beautiful and to meet with your complete satisfaction.